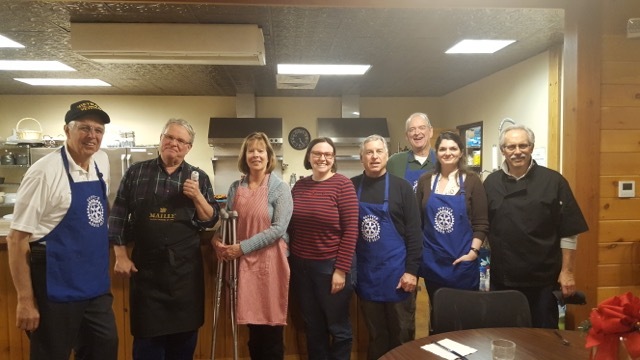 On Friday, January 6, 2017 Rotarians prepared and served dinner to a group of Veterans and their families staying at Boulder Crest Retreat in Bluemont, VA. We also said farewell to Lauri Sisney, the Kitchen and Garden Lady at Boulder Crest. Lauri has been instrumental in supporting our community service at Boulder Crest and will be missed. We wish her well in her retirement. Photo courtesy of Ron Rogos-left to right: Phil Rusciolelli, John Rust, Katie Mann, Valerie Beaudoin, Ron Rogos, Howard Moody, Ariel Welt and Ernie Carnevale. The food was great-directed by Chef Ernie.